Movie 2013, Walt Disney Pictures. Starring; James Franco, Michelle Williams, Rachel Weisz and Mila Kunis. Screenplay by Mitchell Kapner and David Lindsay-Abaire. Novel “The Wonderful Wizard of Oz” by L. Frank Baum. Walt Disney Pictures threw a grand world premiere ball outside their El Capitain movie theater in the middle of Hollywood on Hollywood Blvd. Stars, film makers, press, onlookers and hot air balloon alike were all out to celebrate the movie’s re-telling of a classic and timeless story about one girl’s journey to visit the great “Oz” in “Oz the Great and Powerful”. Director, Sam Raimi explained how the telling of this story has been changed. 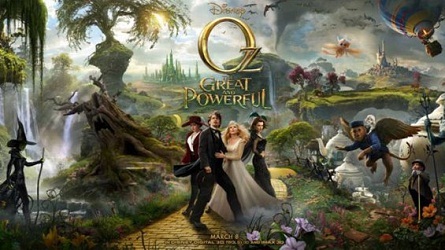 He said that the screenplay is based on the series of books of “The Wizard of Oz” written by L. Frank Baum. He said, the stories are about how the wizard got to the land of oz and who he was. Screenwriter Mitchell Kapner took those elements and put them in chronological order. Raimi also said that when audiences see the film, there are some characters added that are ones Baum wrote about but weren’t in the original movie . For example – “the china girl or china town” he said is in this movie. “Although “we’ve seen the the flying monkeys from the Wicked Witch of the West,” but haven’t seen them talk or know that they’re gentle creatures said Raimi. Actor Zach Braff who plays “Frank/Finley” (monkey) said that filming the monkey and capturing him was tricky. “Sometimes I was squatting down in a blue onesy, sometimes I was in a booth with cameras all over me. Sometimes I would operate a puppet.” He said it was tricky to have an animated character with live action people. 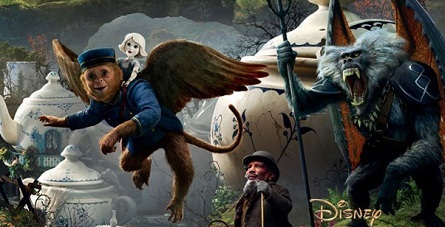 Franco said that almost every shot in “Oz the Great and Powerful” was an effects shot. The movie’s Production Designer, Robert Stromberg who won an Oscar for “Avatar,” and another one for “Alice in Wonderland” did all the designs for it, said he was influenced by early Disney designs and went back to movies like “Snow White” and “Pinocchio.” Franco said he’d been showing those classic cartoon features in his UCLA class and does in fact see the inspiration. Raimi stated that the screenplay is inspired by the land of Oz, but it’s an original work. “When you say it’s the land we know, it is. It’s all of Baum’s creations.” Raimi said the difference is, is that it’s an original story that most audiences are not aware of yet. That is the story of who the Wizard was.